Researchers from UCL (University College London) have demonstrated how an interplay between nutrition, metabolism and immunity is involved in the process of ageing. The two new studies, supported by the Biotechnology and Biological Sciences Research Council (BBSRC), could help to enhance our immunity to disease through dietary intervention and help make existing immune system therapies more effective. As we age our immune systems decline. Older people suffer from increased incidence and severity of both infections and cancer. In addition, vaccination becomes less efficient with age. In previous BBSRC funded work, Professor Arne Akbar’s group at UCL showed that ageing in immune system cells known as ‘T lymphocytes’ was controlled by a molecule called ‘p38 MAPK’ that acts as a brake to prevent certain cellular functions. 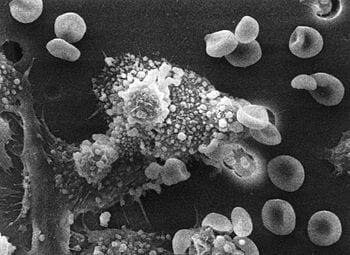 They found that this braking action could be reversed by using a p38 MAPK inhibitor, suggesting the possibility of rejuvenating old T cells using drug treatment. In a new study published today in Nature Immunology the group shows that p38 MAPK is activated by low nutrient levels, coupled with signals associated with age, or senescence, within the cell. It has been suspected for a long time that nutrition, metabolism and immunity are linked and this paper provides a prototype mechanism of how nutrient and senescence signals converge to regulate the function of T lymphocytes. April 18, 2019 - Gene therapy might be a cure for "bubble boy disease" CBS NewsEight babies with "bubble boy disease" have had it fixed by a gene therapy made from one of the immune system's worst enemies. April 12, 2019 - In an age of vaccine hesitancy, complacency over animal immunisation is a deadly mistake The TelegraphRanking alongside Ebola, HIV and antibiotic resistance is a major global health threat entirely of our own making known as “vaccine hesitancy”. April 8, 2019 - Rising hunger among the elderly could mean higher rates of malnutrition Pittsburgh Post-GazetteThere's particular concern in Philadelphia, with its unusually high poverty rates. March 26, 2019 - How effective is the new herpes zoster vaccine? Medical News BulletinA recent study in The BMJ compared the effectiveness and safety of a new herpes zoster vaccine with its older alternative. April 1, 2019 - DNA 'hot spots' may explain why we are different from one another Genetic Literacy ProjectWhat makes one person different from one another, and how did these differences evolve? A study by University at Buffalo biologists is illuminating one.